I am loving all of these pastel colours at the moment. I have seen so many beautiful pieces on the high street at the moment and I want it alllll. However, I am currently very broke so I am living life through my wish lists as always. These shoes from Dorothy Perkins are so adorable and perfect for the summer. I wouldn't normally choose something like this but I want to try some different styles this summer. I think they would be fab on holiday and great to wear with jeans if we don't have a glorious summer that we all wish for each year. The dress and trousers aren't usually pieces I pick out either but I really want to mix up my style a bit more and I am really drawn to these colours at the moment. These trousers would be perfect for travelling, paired with a white T-shirt and a pair of converse, roll the bottoms for a relaxed but summer ready style, alternatively a pretty top, jewellery and some heels and you have the perfect drinking in a beer garden combo. 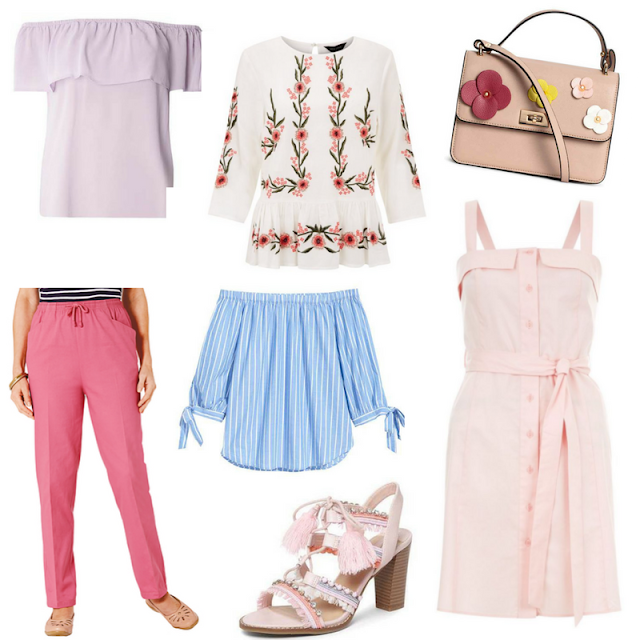 The white embroidered top is my favourite out of this wish list I am still loving the embroidered trend. Im so glad its still heavily featured on the high street. This one is from Newlook and is also a bargain at only £24.99 ! !